​When we look at the world today we can see many things to give us cause for worry and fear. This reality can lead to a loss of hope and a defeatist mentality. 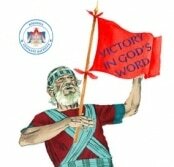 Now, more than ever we need the mentality of Joshua, the mentality of Victory. If it were not for the Joshua course, I may not have had the courage to face my worst fear. We are overcomers through our faith in Jesus. ​Presented Sat & Sun 9am-5pm including Sunday Mass.